Stefan Klein writes engaging books about big, important subjects. His last book, THE SCIENCE OF HAPPINESS, was a #1 International Best Seller. It won Klein the Georg von Holtzbrinck Prize for Scientific Journalism. What Klein does is pile together data from a wide assortment of scientific studies in many different disciplines and then combine them with factoids from history and modern culture in order to look at some Big Human Question from many different angles. Then he puts the puzzle pieces together and comes up with cogent answers that make a lot of sense. All this dancing around encourages other people to look at and explore new directions (or resurrect old ones) that may lead to more effective ways of walking in our post-modern age. It’s a lot like putting together a life-built poem, actually. The book does not get into the big moral issues about whether we humans are inherently “good” or “bad.” It doesn’t lay a lot of shoulds and oughtas on you. What this book does instead is take a look at what scientists and other observers have discovered about human nature. Surprisingly, these findings back up and validate what all the wisdom-systems of the world have been saying: Humans are built to connect with one another and help each other. 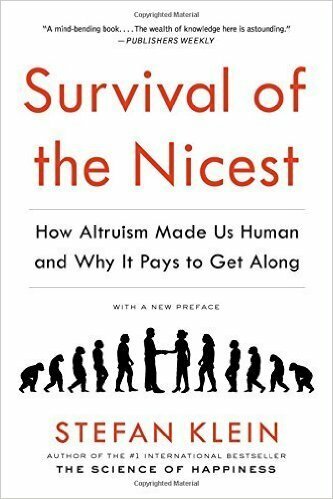 Altruism, the urge to help others, is locked into our genes side-by-side with alpha-dog tendencies and the urge for autonomy. Cooperation and collaboration were the tools our ancestors used in the distant past to upgrade human existence, step-by-step. Our predecessors of long ago lived in caves and other nasty places and spent their time running away from lions and tigers and bears and placating bullying neighbors while trying to keep their children from starving. Because our ancestors banded together and developed ways to work with one another towards common purposes, many of us today have been raised to a very different level of existence. Now we live in cities, towns and communities that depend on the efforts of many good folks to keep them running right. Some of us work on keeping the rest of us from killing off all the lions, tigers and bears who used to feed on our ancestors. We’re still trying to find ways to discourage overt bullying tendencies that are also a part of our basic human equipment, and we keep trying to find ways to stem an epidemic of obesity. The “me-me-me” guys don’t get it all their way, it seems. Any act of kindness has a ripple-effect that spreads, the scientists have found. In one report published in the New England Journal of Medicine, there was a story about an incredible cascade of altruism that was triggered in 2007 by a 28-year-old man who decided to donate a kidney to anyone who needed it. He gave away the organ without expecting anything in return. The young man’s donated kidney was transplanted into a 53-year-old woman in Arizona. Her husband, who was unable to give her a kidney because of incompatibility, offered to donate his kidney to someone who needed it. The recipient of that kidney was a young woman in Ohio whose mother then donated an organ. This chain continued. Brothers donated because someone had helped their sisters, friends gave their kidneys because some anonymous donor had saved their buddy’s life. The chain crisscrossed America. It ignored racial boundaries. No one was forced to undergo an organ removal. Donors often waited months to find a compatible recipient to whom their kidney could be given. At the end of the study, there had been a total of 22 operations. The last one reported was an organ donated by a young African American woman in Ohio. None of the donors gained any personal advantage from their donation. They were all simply acting out of gratitude that some unknown person had given back a life to their loved one. Stories like this one show that kindness really is contagious. People who see other people being kind to each other are more willing to be kind their own selves. I also have to say this book is not all sweetness-and-light, mostly because we humans are not. Studies delineate all the reasons why the Dark Side of humans evolved. There were good life-and-death reasons for it. All of us are made of both sets of impulses – the lion and the lamb lives in us all. How we deal with these impulses in ourselves and others determines how we deal with each other. Klein is assiduous in pointing out the pitfalls of ignoring the actions of the ones who refuse to get with the program. He even suggests ways to counter such self-serving moves. As Klein says, this flood of findings by scientists can help us design ways to encourage people’s more generous propensities and discourage their thug tendencies. Thinking on these insights can help us develop ourselves into individuals who can build the sorts of sustainable communities in which we want to spend our lives. Klein lays out various strategies that help encourage and nurture the loving-kindness that lurks in the human heart. Connection counters and heals the Lone Cowboy Syndrome. The more people can understand and accept that each of us is part of all of us, that we are all interdependent beings and we need one another, the better prepared we will be to share resources and help each other. Long-term commitments and common interests promote loyalty and selflessness more than short-term arrangements do. The saddest commentary I have ever heard describing a person of my acquaintance was this: “Oh, him….He only has NEW friends. Fairness promotes cooperation and trust among people. Unfairness is fatal, as is allowing freeloaders to take advantage of a system based on generosity. People are often willing to forego large personal advantages as long as they are convinced that others are being fair. Nothing destroys cooperation as fast as feeling exploited. Tolerance and respect for other people’s differences promotes voluntary cooperation while coercion and control (as well as specious rewards) tend to destroy it. Sitting on people’s heads will not change their minds. Transparency in the public arena encourages right behavior. This works because cooperative people benefit from their good reputations. Audible, public praise for even small contributions to the common good are often more effective than punishing malefactors in encouraging our altruistic natures to unfold. I recommend this book as a thought-provoking read, one likely to have you coming back to it again and again. Many of the wise guys tell us that we create the worlds in which we live. In this book Klein presents an array of scientific proof that says we can, indeed, work to make a paradise right here on earth. All it really takes is getting into the habit of showing loving-kindness to one another. A premise to dream on. That leaves a wake of broken dreams behind. Collecting sweet joys to share. Stepping all over everybody else’s feet. Ahimsa does not work then. It cannot help to show the way. And you march him on out that dance hall door…. The one where you throw away another piece of your own self. Wandering outside in the cold.